Home Features Has Maurizio Sarri Now Entered Survival Mode? 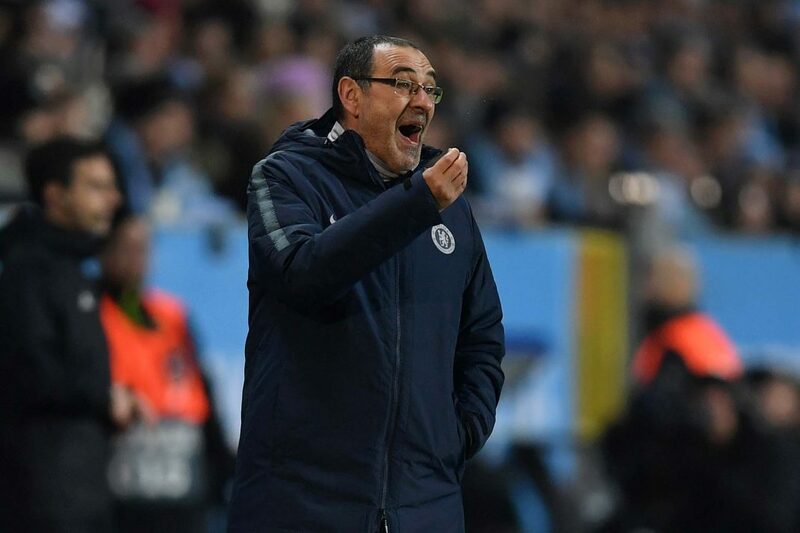 Maurizio Sarri, gives his team instructions during the UEFA Europa League Round of 32 First Leg match between Malmo FF and Chelsea at Malmoe Stadion on February 14, 2019 in Malmo, Sweden. After February’s 6-0 defeat away at Manchester City, many felt that the writing was on the wall for Chelsea manager Maurizio Sarri and it would be a case of not if, but when, he would go on to be sacked by owner Roman Abramovich. The Russian oligarch is never one to be embarrassed and he would have been undoubtedly seething at having to witness such a limp offering from the Blues, one that saw them 4-0 down in just the first 25 minutes. To make matters worse, that was all but a dress rehearsal for the Carabao Cup final just a fortnight later; if Chelsea were to turn in another abject performance such as the one at the Etihad, a change of manager would undoubtedly soon follow. Although Chelsea failed to deliver the first trophy to Sarri in his managerial career, they by no means disgraced themselves, either, and that game would have certainly given the former Napoli boss a stay of execution – especially when you consider that after the loss to Manchester City on penalties, no-one was actually talking about the performance of the West Londoners. Instead, the headlines were dominated by the subordination of Blues’ goalkeeper Kepa Arrizabalaga. His refusal to be subbed off in the final minutes of extra-time after showing signs of cramp unsurprisingly drew the ire of the 60-year-old Sarri and meant that the focus had switched away from what was ultimately a very solid Chelsea performance. Even in defeat, it seems as if that showing has been the launchpad for the club to rediscover their form and just when they need it the most, especially as the race to finish in the top four of the Premier League has intensified. It looked as if it was going to be three teams competing over just the one available space that was left to fight for, although that has since changed after Tottenham’s indifferent recent form and it now means that four clubs are scrapping over two Champions League slots. It’s a battle that Chelsea look well-placed to come out on top of and this is a feeling that is shared by the bookmakers. A look at the current Premier League betting has them priced at evens to finish third or fourth in the table. Although they might be on the fringes of the race for the top four at present, they do have the wildcard of a game in hand and should they get the better of Brighton in April, they will then be catapulted right into the mix once more. At the same time, they do also have the backup plan of winning the Europa League, something that also provides entry to Europe’s premier club competition next season. Because of this, Chelsea have reasons to be positive in these final few weeks of the campaign. Not only that, but it has alleviated the immediate pressure that was resting on the shoulders of Maurizio Sarri, and although he is not out of the woods just yet, a top-four finish or Europa League success should increase his chances of staying in the Stamford Bridge hot seat during the summer and beyond.